Psoriasis is a systemic disease with numerous concomitant metabolic disorders. Apparently, T-helper 17 lymphocytes and interleukin (IL)-17 constitute an important element linking those disorders. The role of IL-17 has been confirmed by numerous studies, although it remains not completely understood, and the study results are controversial. Based on the studies performed so far, it is assumed that IL-17 contributes to development of atherosclerosis by means of: stimulation of production of proinflammatory compounds; induction of apoptosis of endothelial cells and heart muscle cells; stimulation of von Willebrand factor production; and induction of the matrix metalloproteinase-9 (atherosclerotic plaque rupture). On the other hand, IL-17 may exert protective activity due to inhibition of proatherogenic interferon-γ and vascular cell adhesion molecule-1, and production of type I collagen by smooth muscle cells. The role of IL-17 in the pathogenesis of obesity is as important as other proinflammatory cytokines. On the other hand, its deficiency increases diet-induced obesity and accelerates adipose tissue accumulation. Although the role of IL-17A in the pathogenesis of metabolic disorders in humans remains controversial, introduction of anti-IL-17A treatments brings hope that development of metabolic disorders in patients with psoriasis may be inhibited. T helper (Th) cell subsets secrete cytokines that regulate other immune cells. Interleukin (IL)-17 and IL-22 belong to a new class of cytokines with predominant effects on epithelial cells. Thus, these cytokines are key molecules in several disease processes. IL-17 and IL-22 are released by leukocytes such as Th and natural killer cell populations. 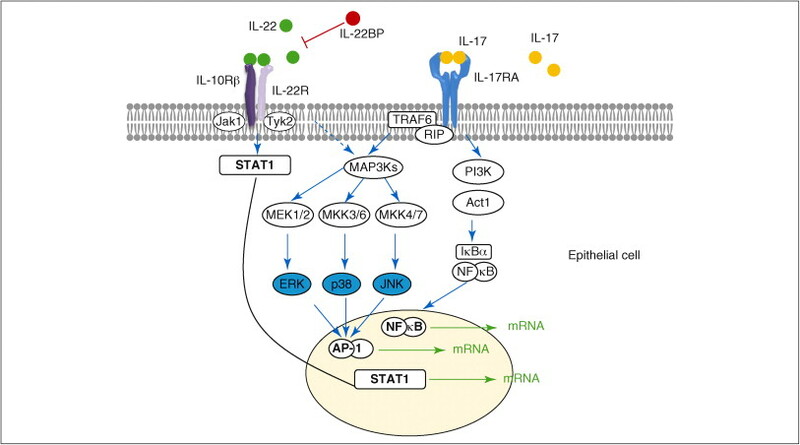 Both IL-17 and IL-22 induce an innate immune response in epithelial cells, but their functional spectra are generally distinct. IL-17 induces an inflammatory tissue response and is involved in the pathogenesis of several autoimmune diseases, whereas IL-22 is protective/regenerative. This review juxtaposes IL-17 and IL-22 and describes overlaps and differences regarding their cellular sources, biochemical structure, signaling cascades in target cells, and function.